Nehemiah rises up quietly during the night and takes a few soldiers with him to see the condition of the wall of Jerusalem. IN THE PALACEof King Artaxerxes was a noble young man who daily waited on the great ruler. This young man’s name was Nehemiah, and he was a Jew. Although he was very rich, and favored more than any of the King’s servants, yet Nehemiah was a humble-minded young man. And this is a story that tells us about a part of his eventful life: “In the twentieth year of King Artaxerxes’ reign I was in the palace of Shushan as cupbearer of the King when my brother Hanani and certain other men came from the land of Judah. I was eager to see them and to hear news from the land of my fathers, so when my duties were done I asked them about Jerusalem and about those Jews who had gone back to rebuild the temple of the Lord. “My brother and his companions shook their heads sorrowfully, and replied that things were not going well in the city where David once ruled so gloriously as king of God‘s people. They told me that the wall which Nebuchadnezzar and his soldiers had torn down and burned many years ago had never been repaired, and that the place looked very desolate, and unworthy of the great name that once had made it a glory in the earth. They also told me that the Jews who had returned were now poor and greatly oppressed by their enemies round about. “When I heard these words I sat down and wept, for my heart was grieved, and I longed to see the prosperity of my people. Then there stirred within me a desire to help them, so I fasted and prayed earnestly to the God of heaven, and besought him to grant me the favor of the King. For I knew I could do nothing to help my people except the King should give his consent. “One day while I stood by the King’s table pouring wine into his goblet, I could not keep my thoughts on my work. And I could not speak so cheerfully as was my usual manner, for my heart was saddened by the great needs of my people. The King noticed my sad countenance, and he asked what had caused my sorrow of heart; for he knew I was not sick. Then I was afraid, for I thought surely he was displeased with me. But I told him that I had heard sad news from my people in Judah, and I told him about the broken walls of Jerusalem and the oppressed condition of the Jews. “The King listened patiently, then asked what I desired of him. Before answering, I breathed a prayer to the God of heaven, and then I said, ‘If it please the King, and if I have found favor in your eyes, I ask that you send me to Jerusalem to rebuild the city of my fathers.’ The Queen also was sitting by, listening, and the King asked how long I should be absent from his palace. I told him how long my journey would be, and that I might not return for many days. But it pleased him to send me, and to give me letters to the rulers near Judah, telling them to help me on the way. He also gave me a letter to the man who was the keeper of his forest, telling him to permit me to get trees from the forest with which to rebuild the gates of the city walls. 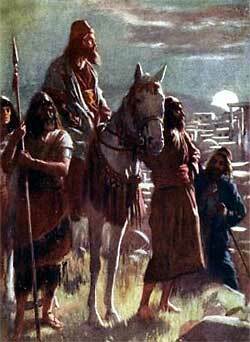 “I did not start out on this long, dangerous journey alone, for the King sent captains and soldiers of his army with me, and we rode on horses, which he provided. After many days we came to the rulers of the countries near Judah, and I showed to them the letters that King Artaxerxes had written. These rulers were not friendly with the poor Jews at Jerusalem, and they were sorry because I had come to strengthen the city. But they dared not hinder me, so I passed on and soon came to Judah. “For three days I rested, then I rose up quietly during the night and took a few of my soldiers with me to discover the true condition of the city wall. We passed out through the entrance by the valley gate and I rode around the city. No one except my companions knew what I was doing, and none of the people of Jerusalem knew why I had come to visit them. But after my ride that night I felt prepared to talk to them about the task that I had come to accomplish. For I found the broken walls lying in heaps of ruins, and in some places my horse could not find a path. This entry was posted in Discipleship and tagged Artaxerxes I of Persia, Christ Jesus, God, Hanani, Jerusalem, Jew, Judah, Nehemiah, Old Testament, Susa, theology. Bookmark the permalink.